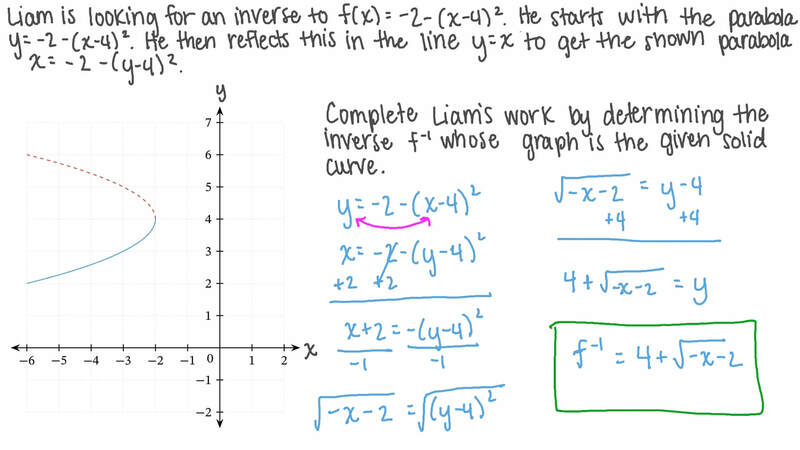 In this lesson, we will learn how to use a graph to find the inverse of a function and will explore the symmetry between the graph of a function and that of its inverse. The following is the graph of 𝑓 ( 𝑥 ) = 2 𝑥 − 1 . Which one is the graph of the inverse function 𝑓 ( 𝑥 ) − 1 ? Amir is looking for an inverse to . He starts with the parabola . He then reflects this in the line to get the shown parabola . Complete Amir’s work by determining the inverse whose graph is the given solid curve. The following graph is of the function 𝑓 ( 𝑥 ) = 6 𝑥 + 8 𝑥 + 1 2 , with its maximum at  1 3 , 9  , minimum at ( − 3 , − 1 ) , and zero at − 4 3 marked. Find an expression for the inverse function 𝑓 − 1 when 𝑓 is restricted to the interval 𝑥 ≥ 1 3 . What is the domain of 𝑓 − 1 in this case? Consider the two following figures. The first figure shows the graph of 𝑓 ( 𝑥 ) = 𝑥  and a tangent to the graph with gradient 1. This tangent meets the graph at a point with 𝑥 -coordinate 1 √ 3 . The second figure shows the graphs of 𝑔 ( 𝑥 ) = 𝑥 + 𝑏  and its inverse 𝑔 ( 𝑥 ) = ( 𝑥 − 𝑏 )     . The graphs cross in the third quadrant and touch in the first quadrant. What is the value of 𝑏 ? What are the 𝑥 -coordinates of the two points of intersection of the graphs in the second figure? The graphs of 𝑓 ( 𝑥 ) = 𝑥 + 𝑏  and its inverse 𝑓 ( 𝑥 )   intersect at three points, one of which is  4 5 , 4 5  . Determine the value of 𝑏 . Find the 𝑥 -coordinate of the point 𝐴 marked on the figure. Find the 𝑥 -coordinate of the point 𝐵 marked on the figure. The following graph is of the function , with its maximum at , minimum at , and zero at marked. Find an expression for the inverse function when is restricted to the interval . What is the domain of in this case? The following graph is of the function 𝑓 ( 𝑥 ) = 6 𝑥 + 8 𝑥 + 1 2 , with its maximum at  1 3 , 9  , minimum at ( − 3 , − 1 ) , and zero at − 4 3 labeled. Find an expression for the inverse function 𝑓 − 1 when 𝑓 is restricted to the interval − 4 3 < 𝑥 ≤ 1 3 . Determine whether the inverse of the represented function is a function or not. In the given figure, the green points represent the function 𝑓 ( 𝑥 ) . Do the blue points represent 𝑓 ( 𝑥 ) − 1 ?